Maher asks, "How do you reconcile this idea that it all comes from the Bible, but the Bible is so flawed ... I mean, it's just so full of either nonsense or viciousness." In response, Wallis steered the conversation back to the topic of social justice and compassion, often overlooked Biblical mandates. 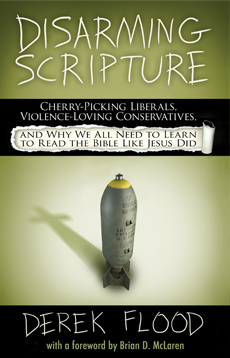 Maher objected several times, accusing Wallis of "cherry-picking the good parts" of the Bible while ignoring the bad parts. I'm a big fan of Jim Wallis (heck, I blog for Sojourners! ), and I appreciate that he moved the conversation away from Maher's attempted divisiveness and back to caring for the poor and immigration reform in this country. He's totally right that caring for the marginalized should be the priority of us Christians, and I understand that he wanted to stay focused on that. At the same time, I think the question Bill Maher was raising is an important one, too, because it ultimately has to do with caring for the marginalized as well. That is, when the Bible is read in a hurtful way, it can and has been used throughout history to justify horrendous violence and mistreatment. That matters, and consequently it matters how we read the Bible. So as someone who has focused on confronting those "bad parts" in Scripture, I wanted to take a stab at addressing Maher's questions. "Explain to me," Maher said, "how a book that's written by God, who's perfect, has so much ... It's pro-slavery, pro-polygamy, it's homophobic, God in the Old Testament is a psychotic mass murder ... and I always say to my religious friends: If a pool had even one turd in it, would you jump in?" The implication here is that if we find anything bad in the Bible this would invalidate it all, because it is supposed to be a perfect book written by a single author with one unified voice. But that simply is not what the Bible in actuality is. In reality the Bible contains a multitude of conflicting and competing voices, articulating opposing perspectives in the form of an ongoing dispute contained throughout its pages. More concretely, we find an ongoing dispute within the Old Testament between two opposing narratives: The first is a narrative of unquestioning obedience that condemns all questioning (often enforcing this through threat of violence). This is the narrative Maher has zeroed in on. But within those same pages of the Hebrew Bible there is also a persistent opposing counter-narrative that confronts that first narrative as being untrue and unjust, and that upholds questioning authority in the name of compassion as a virtue. Jesus and the New Testament as a whole are an extension of this second counter-narrative of protest (which explains why Maher says to Wallis "I'm down with you padre, I think Jesus is a great philosopher"). But what is truly remarkable is not simply the difference between the Old and New Testaments, but that these conflicting voices were included side-by-side within in the Hebrew canon itself. The Old Testament is a record of dispute which makes room for questions by its very nature. Because of this, it calls us to enter into that dispute ourselves as we read. In fact, because of its multiple conflicting narratives we simply must choose, we must take sides in the debate, we are forced to embrace some narratives in the Bible and reject others. So I choose to embrace the narrative of compassion and social justice that is found in both Testaments, and reject the narrative of using religion and the Bible to justify violence and oppression, which can be found there, too. Now is that cherry-picking? No, it's not, and I'll tell you why: Cherry-picking is when you misrepresent the evidence by referring to only the good parts as if they are representative of the whole, while ignoring the bad parts as if they were not there. It's not about choosing the good over the bad; it's about giving a false impression that it's all good and there is no bad. I'm not denying that there are bad parts, and I'm not trying to justify or downplay them. On the contrary, I think it's imperative that we confront them. That confrontation is in fact modeled for us within the pages of the Old Testament, and expanded on further by Jesus who follows in that same prophetic tradition of faithful questioning. At the end of the interview Jim Wallis concluded, "You can find all kinds of things in the Bible that have led to patriarchy, oppression, violence, division" However, he continued, "you also can point to faith communities at the center of every social reform movement in this country invoking the same Bible for social justice and for peace." I see Wallis here embracing the biblical narrative of social justice and peace, while rejecting the narrative of patriarchy, oppression, violence, division. To that I can add my hearty "amen." The difficulty, I think, is that we progressives often feel the need to apologize for making those kinds of choices when we read Scripture — both to those on the religious right who criticize us for not reading the Bible like a fundamentalist, and to those on the anti-religious left like Bill Maher who (ironically) have likewise assumed a fundamentalist reading of the Bible themselves. 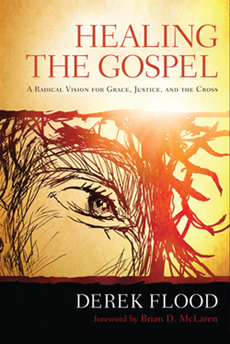 So what I want to say to my fellow progressives is that we should choose, and that we find a clear biblical precedent and legitimization within in the Hebrew Bible itself for making those choices for justice and compassion, as well as in the way Jesus engaged Scripture — evident in his frequent confrontations with the religious authorities of his own faith who held to the narrative of unquestioning obedience. A faithful reading of Scripture is therefore not about defending the bad parts of the Bible (whether by seeking to justify or downplay them). On the contrary, a faithful reading entails wrestling with those troubling texts as the biblical authors did themselves. When we are standing up against the voice of authority in the name of the voiceless, we find ourselves in the company of the many counter-voices within the Bible who are doing the same. We find ourselves engaging the Bible in the same way the prophets did, and the same way Jesus did. That's a good place to be. As people of faith, we shouldn't wait for Bill Maher to ask these questions, we should already be wrestling with these troubling texts ourselves. After all, the very name "Israel" means "wrestles with God." Thanks Derek for this. Well done. The body of Christ (the CHURCH) has not been trained well in this area and so many look like idiots when it comes to the Biblical Conversation represented here. I was disappointed that Wallis chose to answer a question with a question ...although it may have been best that he did. I think that Bill was asking a question that is prevailing in our society. Ultimately, "Can you believe in the words of the Bible as words from God to Man if it is all open to interpretation?" Is not that what the Bible has been propagated as? Words to live by? What if our whole premise of identifying the Bible's intent has to be rethought? I think that is what those who hold it sacred fear. Great post. I love the thought that we aren't cherry picking our way through scripture, as I have been doing, but instead choosing to side with the restorative justice "theme" through out the whole of the Bible. Thanks again. Good stuff here, yet again Derek. "A faithful reading of Scripture is therefore not about defending the bad parts of the Bible (whether by seeking to justify or downplay them)." Too many times, Christians are armed with exactly these types of tools (within the 'unified, single-author, inerrant' presupposition of Scripture) and the end result is an apologetic approach that defies conscience and is only reasonable within such a framework. "If God said it, it must be true, and there cannot be any disagreement." Consequently, many intellectual and conscionable believers feel they must choose between the "inerrant" position and a total rejection of Scripture. Being unable to reconcile this with their own hearts and minds, they end up rejecting the Bible or Jesus altogether. I find that the documentary hypothesis can shed some light on this historically. Those with centralized power over Israel almost always present the narratives you are speaking of, where God is presented as a hierarchical and domineering figure which reflects their own power structures. By way of contrast, the prophetic voices, which are decentralized and of the people, evince a completely different reality for God--as you stated--embodied by a subversive Jesus. I think this is the first I've heard about the debate between Old Testament voices - is it possible for you to give me some examples or point me to somewhere I could learn more about this? Sorry if the comments section is not intended for this purpose. I'm currently writing a book where I illustrate this in detail. I'm not really aware of another book that does this (which is part of the reason I'm doing it. There are scholarly resources that focus on this. A big one is Bruggemann's Theology of the Old Testament where he lays out the case that the Hebrew Bible is characterized by dispute. That's pretty heavy reading though, which is perhaps why the idea is not very well known. Some brief examples would be how the Prophets contract the law in regards to ritual, or how the Psalms and Job contradict the Prophets and the law's claiming that suffering is the result of sin. If you read the OT as a whole you can see that it is one long record of dispute. We even see this in "this saith the Lord" statements where one declaration of God directly contradicts a previous one. For example the law has God declare that children are punished for the sins of the fathers. The prophets have God say the opposite, directly condemning the previous statement. "What if our whole premise of identifying the Bible's intent has to be rethought?" Yes, I think it does. Our focus has been on scripture being infallible, meaning it is beyond question. The example of both Jesus and the Hebrew Bible is that questioning is characteristic of a faithful reading. So we should question and challenge things in the Bible that are hurtful. Since the Bible has historically lead to atrocity this proves that it is clearly not infallible. Thank you very much for your response. Your book sounds very interesting and as though it will be much-needed. Thank you especially for the examples of instances of dispute - I had noticed the difference in 'thus saith the Lord' statements previously. In any case, it seems clear historically Christians have never interpreted the OT like 19th century Fundamentalists or many conservative Protestants of various stripes today! Thanks for the resources ofGrace. Would you care to summarize the perspective they had for us? The early Church Fathers read the OT through the lens of its fulfillment in Christ. This is following the teaching Christ Himself gave to His disciples (Luke 24:27). Even the Apostles, first-century Jews, did not understand the significance of much of their own Scriptures until this was revealed in and by Christ. Following in this Apostolic tradition, the early Fathers read the OT narratives--particularly the historical narratives--in an allegorical (not historical-critical) manner for how these spoke of Christ. They did not dismiss the literal sense of the narratives (and likely would not dismiss much what historical-critical research may reveal to illumine that literal level of meaning in the text), but did not understand the spiritual truth to which these point to be found on the level of the literal sense. I should clarify for readers that I'm using the term "allegorical" in a particular sense that encompasses what we understand as "typological" interpretations of the OT. Derek, YES! thank you for saying what must be said loudly and often: that the popular critique we hear often assumes (presupposes) the most blatant fundamentalist concept of scripture. Maher and et. al. should go ask modern Jews how they read the Bible. They would be shocked. They should be ashamed that they let the right define their views. The Bible is an adult book, not a children's book. It is an ongoing dialogue, a conversation, as you say. There are differences of opinion, and there is a lot at stake for each side. It is a debate. God bless the Jewish community for handing on this debate as a debate, and for not trying to flatten it out as the fundamentalists attempt to do. The bible is lumpy, not smooth. Jesus got this. The Pharisees did not. Amen Steven K! I think it is really important for us progressives to learn to articulate how the Bible should be read so that it leads to grace and compassion. A big problem I see with us progressives is that this is really not articulated or worked out at all. Instead we hear people saying "the Bible is about caring for the poor and being loving" and so it seems to folks like Maher like we are just being naive. We need a complex approach.